All of Carol Trembath's programs include an exciting production for students in grades K-6. Carol’s presentations (with the exception of Kindergarten) run 50 minutes long and include a telling of her book, Water Walkers & Stepping Stones accompanied by a slide presentation. Following the story, she gives a brief description on the process by which a children’s book is made (i.e. early manuscripts, editing, publishing tips). Book signing is included. Every year a number of OjIbway women lead a group called the Mother Earth Water Walkers on a trek around the lakes, rivers, and waterways of the Great Lakes. Why are they walking and how did this tradition start? Who are the Anishinaabek people? Who are “Michigan’s Three Fires”? What is the story behind this story? This program will present the Water Walkers history and images of the Ojibway’s journey. The Three R’s—Reduce, Reuse, and Recycle are stressed. Grades 1-6. 2. Who are the First Nations? Native People have a rich history of respecting the earth. Let’s do a re-run of important First Nations' milestones and contributions from the time of the early explorers to today. We can learn from their guidance and lasting wisdom. What is their impact on American culture? How are today’s Native People working to protect the environment? What can students do? Grades 2-6. 3. I Recycle, Reuse, Reduce—Can You? The human population is growing fast and so are people’s demands on the Earth’s resources. We need to conserve our natural resources so we do not run out of food, water, and fuel. Let’s save water, electricity, fuel, trees, and spend time in nature. The Native People always believed that it was their sacred responsibility to preserve nature for future generations. Come and hear the Water Walkers' story and what kids can do to help the environment. Grades 2-5. Do you want your children to learn more about the ideas of Michigan's Native Americans, the environment, and recycling? Come along with me on a journey to understanding these concepts through a lively compare and contrast experience of my book, Water Walkers, with The Great Kapok Tree by Lynne Cherry. Younger children will be presented with the ideas of learning about ways to help our planet through this visually engaging program. Related hands-on activity included. Grades K-4. 5. How to Be an Author! Carol loves being an author and enjoys sharing the ins and outs of how to get a book published. Her presentation is a show-and-tell of her book from inspiration, to creative ideas, to the finished product. A step-by-step look at the journey down the path to becoming a published author is presented. She includes, rejection letters, original manuscripts, the editing process, and final proofs, as well as the tools necessary to make a niche in the world of books. Grades 3-5. 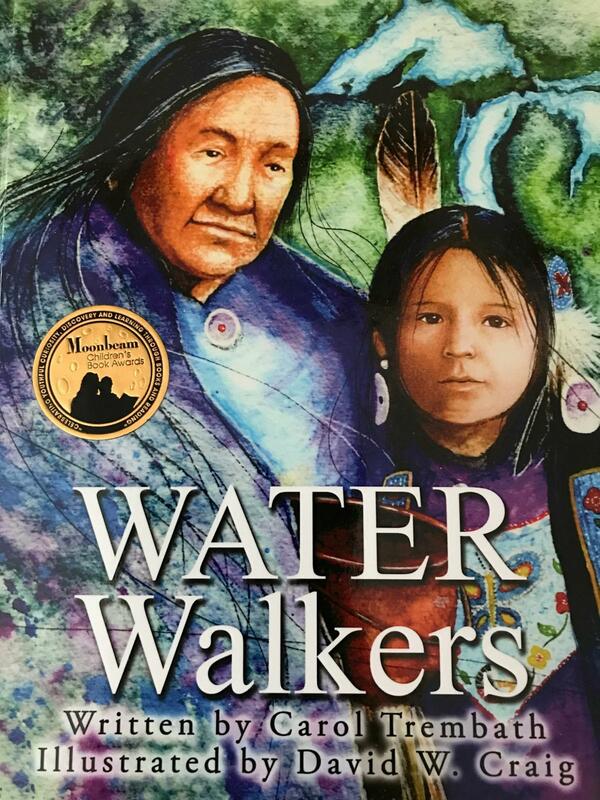 Half-hour program that includes reading of my book including songs and puppets—along with two creative art activities that coordinate with the Water Walkers' story. This 45 minute program introduces students to several aspects of writing. They will learn what three things every story needs—beginning, middle, and end—along with characters, conflict, and resolution. They will hear about what every author keeps in their invisible writer’s backpack that help them write their stories. Do Drops – Complete a “Do Drop Rainbow” that tells how you would make the world a better place. In the course of her presentation, the author covers the following topics in an inspirational, age appropriate, and entertaining manner. Presentations Fees: Email Carol regarding presentation times and fees at: carol.trembath3@gmail.com. A list of materials will be provided if you choose to include art and creative writing activities. In addition a $50.00 travel fee will be assessed for schools more than 50 miles from Brighton. We look forward to helping you plan to visit that fits your school and your budget. Now is the time to teach Water Preservation!